Perfectly sized for the bits and bobs found by pint sized collectors, the Piki Basket and Minichari Bag are sweet accessories for toddlers who love to tote their treasures! From Olli Ella, the rattan Piki Basket and Minichari Bag make for superb storage when it comes to all the things your tot absolutely must take with them, everywhere. Books, toys, trinkets – you name it – it can all be lugged around in sweet style in these hand-woven baskets. The Piki Basket, $39, is a pint sized picnic basket with enough room for toddlers to not only carry their loot, but their lunch as well. Dual handles make it a cinch to carry the load evenly. Slightly smaller in stature, the Minichari Bag, $55, is an adorable handbag with cross body strap. Cleverly, it also moonlights as a handy bike or scooter basket for collecting on the go. So much fun! 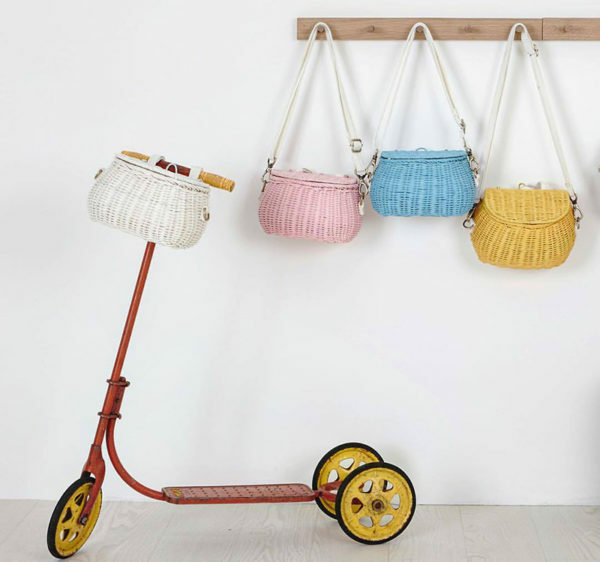 Olli Ella baskets are available in yellow, blue, white, pink and natural. Order direct from Olli Ella.